CardTemp is the latest automation of Electronic Packaging on a 32-bit or 64-bit Windows platform. It is listed on the System Reliability Center web site under R&M Software Tools, Reliability, Design/Analysis, Thermal Analysis, and is the second of three programs. 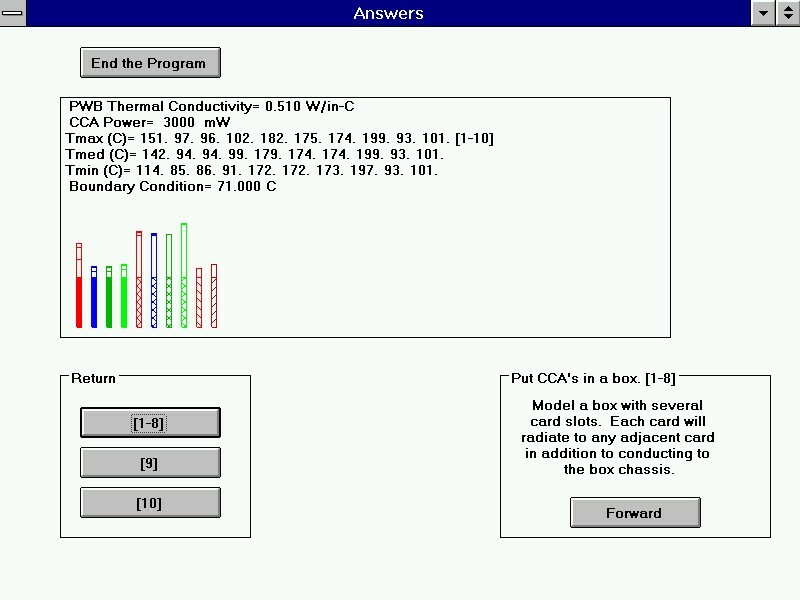 It predicts the steady-state temperatures (maximum, median, minimum) of a printed wiring board (PWB), of a circuit card assembly (CCA), in ten [1-10] thermal solutions. The Electrical Engineer can now conduct Trade Studies during the proposal phase of a procurement bid. Knowing the PWB joule-heating, size, and form-factor limitations on the Thermal Design allows the allocation of circuits to that real-estate with confidence. This allows one PWB to be designed for the first customer and yet also meet the requirements of another similar customer. This saves time and money. Electrical Engineers, in the IEEE CPMT, use it as a quick solution to initiate the design concept of a family of products. Each customer will have his unique requirements met while the vendor benefits from common PWB art-work. How can CardTemp be used? Who benefits from using CardTemp? Solve for the printed wiring board (PWB) temperatures in several housings with different cooling schemes. Compare two thermal solutions so that the same PWB can be used for two customers. Move scroll bars and click option buttons to create an interactive Trade Study. 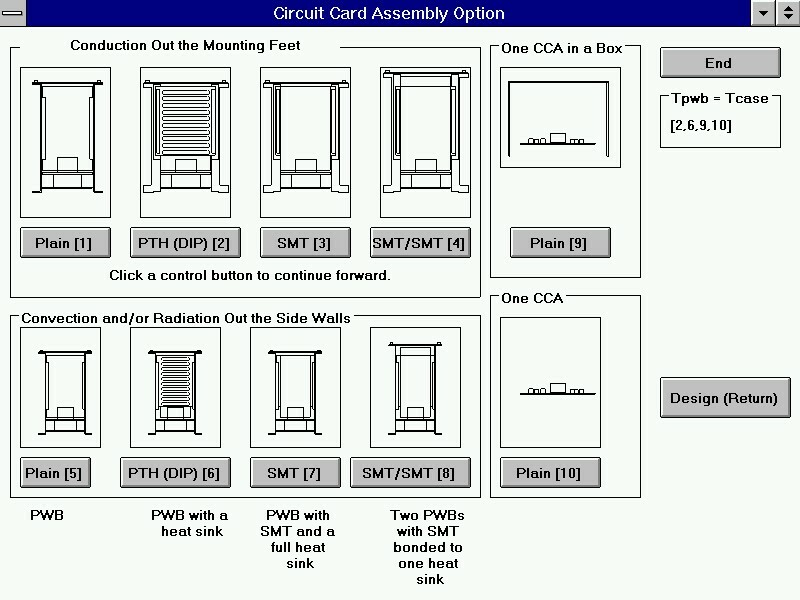 Thus, CardTemp is the Rule-of-Thumb for sizing a PWB for thermal requirements. Harness the power of MIL-HDBK-251 (IEEE CPMT TC-9 and ASME K-16) to calculate PWB temperatures for an electronic box concept. Solve the thermal problem before the environmental test fails and the PWB must be redesigned. Manage your resources before a conflict exists between disciplines. Electrical Engineers use it as a quick solution. Industrial (Reliability) Engineers use it as a simplified solution. Mechanical (Thermal) Engineers use it as a sanity check. 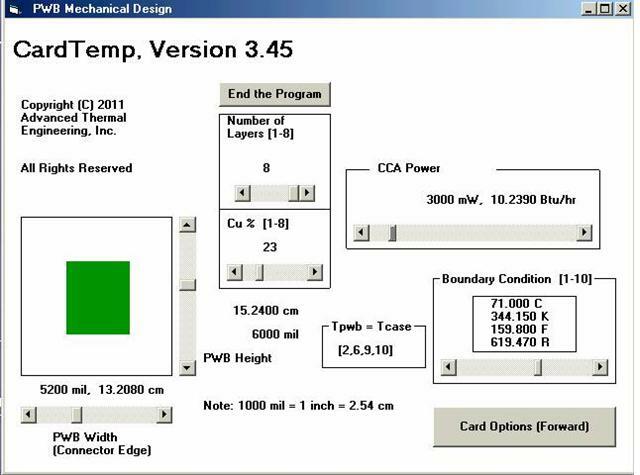 CardTemp solves the Heat Conduction Equation to Predict the PWB Temperatures. make a $400.00 (USD) check payable to Advanced Thermal Engineering, Inc.
and send it to the address below. FreeTemp is the Free Convection subset of CardTemp. make a $200.00 (USD) check payable to Advanced Thermal Engineering, Inc.
Card_Hz is the Rule-of-Thumb for PWB Vibration and Shock Requirements. make a $100.00 (USD) check payable to Advanced Thermal Engineering, Inc.